The tragedy of the Boston Marathon bombing’s has surely taken over the country and it has also been a huge story in sports. Players, coaches, teams and the media have tweeted about it and showed their support for the victims and citizens of Boston. It is also the cover of Sports Illustrated for the second straight week. However, just two days later, the horrific explosion at Fertilizer company in West, Texas didn’t get nearly as much coverage. No matter, Texans can help themselves and our sports teams have showed up using all of their resources including social media. The Dallas Cowboys – the Gene and Jerry Jones Family Charities – have made a $100,000 donation to the Salvation Army to assist in the disaster relief effort in West. However, they didn’t stop there. They are using their popularity to collect donations from fans during their NFL Draft Party at Cowboys Stadium. Similarly, the Houston Texans have donated $25,000 through the proceeds of an auction. The Dallas Mavericks have used their fandom in the same sense, promoting a Blood drive by their stadium. They also got local radio hosts to come in order to push people to come and have advertised this campaign on their Facebook page. They have used their immense following in the area and nationally to create awareness in their effort to help. The Houston Rockets allowed fans to take pictures during a Playoff viewing party with the Championship trophies if they donated. 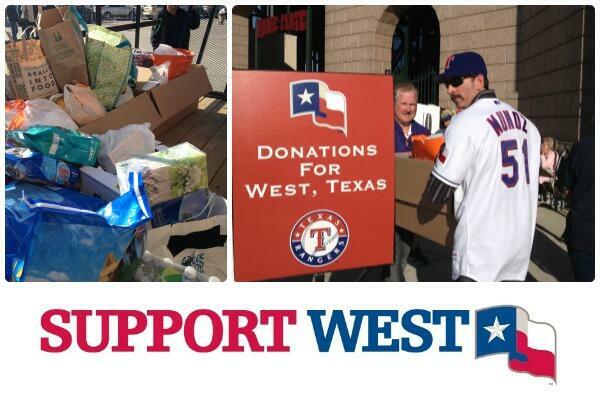 The Texas Rangers, with the season underway, have used the traffic of the fans going to the games on a daily basis to set up relief initiatives. They collected $40,000, 100 blood donations and hundreds of home essentials from fans. They called for fans to come to donate through all of their social media outlets, especially Twitter and Facebook, where they got thousands of likes and shares. The Houston Astros organized something similar.